The Kozienice power plant, working since 1972, is the second largest coal power station of Poland and the first one with regard to productive capacity. 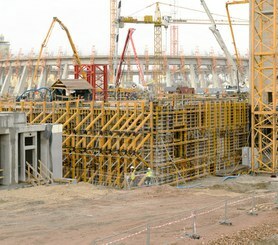 A new energy unit is under construction since 2012. With 1,075 MW, it will increase national energy production by nearly 5%. ULMA supplied equipment for the construction of several installations of the project: the boiler house, the flue-gas desulphurisation system, the building for electric equipment and the cooling tower. 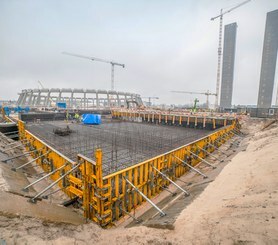 For the 87.1 x 63.35 m big and between 3 and 6 m high boiler house, 20,000 m3 of concrete were poured in a single stage. 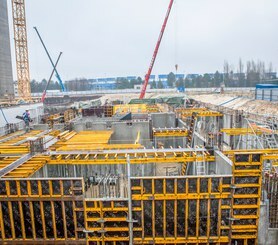 The solid walls necessary in the foundations were built with single-sided SMK trusses assembled with MK walers which made them compatible with any type of wall formwork, in this case ORMA Modular Formwork. 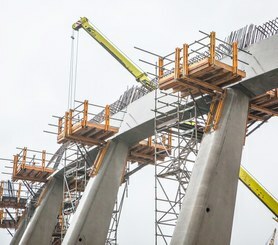 This phase also included 3.3 m high canalisations built with the same system of single-sided wall formwork. At 13 m height, the construction of the circular beam made up of prefabricated beams required a working space to join the different segments. The 2.25 x 2.65 m working platforms with the MK system eased and ensured the pouring in between the beams. The project includes a 4 m wide and 2.7 m high underground hot water pipe running from the tower perimeter towards the centre where it reaches 20 m height. The walls were built with ORMA while for the roof perimeter Tables VR of two sizes were used: 150 x 270 cm and 150 x 360 cm easy-to-handle and adaptable to any area. ULMA accomplished the challenging requirements of this type of projects: cost reduction and highest standards of quality and safety.